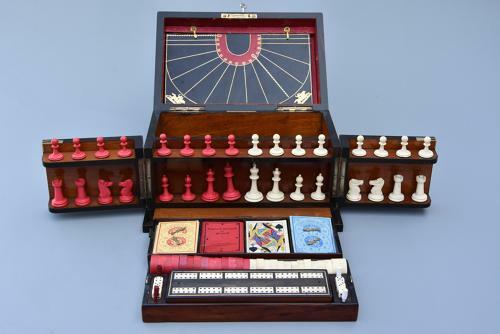 A good quality late 19th century coromandel fitted games compendium by 'Leuchars & Son, 38 & 39 Piccadilly, London'. This games compendium consists of a coromandel box with key, the top and front opening to reveal a games board for either chess, draughts, back gammon or a horse racing game, turned bone chess pieces, dominoes, counters, playing cards, dice, shakers, cribbage board, 5 horses, Rubicon Bezique and Bezique booklet with makers mark 'Leuchars & Son, 38 & 39 Piccadilly, London'. Leuchars, as they were originally known, was established in 1794 and was a company renowned for making dressing cases. The name changed over the years to L Leuchars and then L Leuchars & Son, William (the son) took over in 1847 after his mother's death and subsequently the name was changed again to Leuchars & Son. They exhibited at various exhibitions of the time and gained awards, eventually the business and factory being sold to Asprey in 1888. This games compendium is in very good condition for age, is of stable construction and can go straight into a home.